Iceland is an amazing photographic country. Every time I return to teach a workshop there, I’m always astounded by the changes I see. I’ve been fortunate to photograph many of its larger than life waterfalls, Aurora Borealis and inland glaciers. It’s truly a dynamic and changing location to photograph. One location that fascinates me more than most is Jökulsárlón Glacier Lagoon. The place I enjoy most nearby is Diamond beach. This is the ocean outlet from the lagoon that leads to the ocean. It’s always in a constant state of change, much like Iceland’s weather and the dancing lights of the Aurora Borealis. You might think you have an idea of what to expect from all the photography that’s been coming out of this region in recent years. But honestly, it’s never quite what you think it’s going to be once you arrive. Jökulsárlón glacier is the largest in Europe. Ocean beach bound ice chunks to come to rest on famous Diamond Beach as the glacier rapidly melts. Each year the glacier moves further back into a deep distant valley creating a lagoon. All this is the result of global warming it would seem, over the last 15 to 20 years. 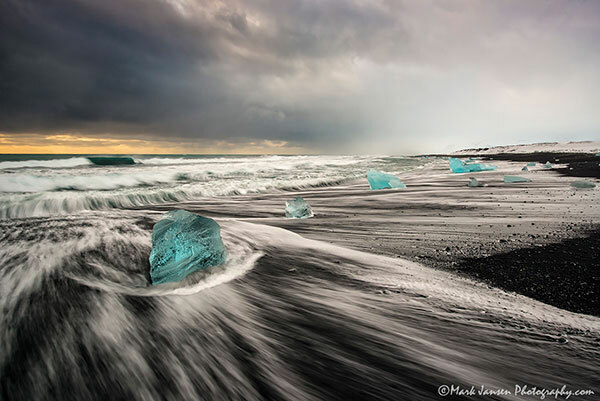 The creative process and the dynamics of this environment are quite exciting, as is the entire country of Iceland to the creative landscape photographer’s eye. Some say, once the melting of Jökulsárlón is accelerated, Glacier Lagoon will become a large landlocked lake, with no access to the sea. Diamond Beach will be only a memory of photographic capture. Not to worry, this won’t happen for some time. When photographing these ice chunks on the beach, one must be aware of every sense! From where you’re physically standing, to where the tidal waters are approaching, you need to anticipate a rapid change at any moment by being fearless but not going beyond your comfort level. On top of all this, as you’re using your creative toolbox to see patterns in this ever-changing and erratic shoreline environment, one must keep one eye on their gear and one eye on nature at all times! As with any landscape location, I always like to do a visual survey. I tell my workshop clients to resist the urge to just start shooting at anything in front of them that looks different or unusual without thinking through their composition in its entirety. 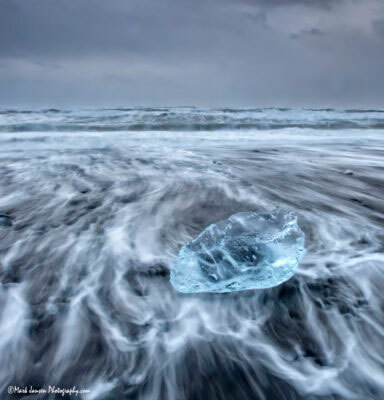 In this case, chunks of ice on the beach are the subject. While this looks amazing to anyone seeing this for the first time, keep in mind, they are nothing but objects. They must be placed accordingly into any landscape image in order to create a compelling composition. Once I arrive at Diamond beach, I determine if the light is right for what I’m trying to achieve creatively. Or, in most cases, I work with what’s presented. This could be a late afternoon sun or it could be completely overcast. I’ll take a little hike up and down the beach to see what’s actually developing before I mount my camera on the tripod. Diamond Beach is a location where you’re dealing with the most erratic sand and water that you’ve ever seen before. That might be because Iceland is exposed to the historically turbulent North Atlantic. Plus, when you factor in large chunks of ice moving with wave action, you really need to be on your game. Having a qualified guide while photographing Iceland is essential to getting the shot here. Time to get your boots wet! 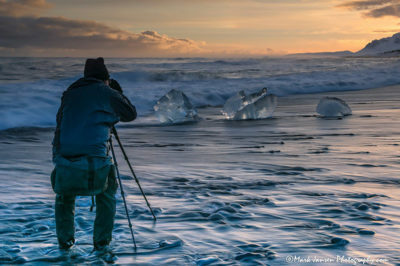 A common approach for many on this beach is to set up a tripod high and dry at a safe distance and shoot directly into the ocean, with chunks of ice in the foreground. This is a relatively simple and safe approach. You’ll see many people lying back and showing a healthy respect for the ocean, and getting some shots. This is great, but doesn’t really reflect the dynamic imagery this environment can produce! What I like is a little more of an immersive experience, where my tripod legs become more like large sand stakes, rather than a classic tripod. First, I seek a composition looking for the proper angle. I prefer a diagonal approach to the beach, rather than the straight out to sea. I like to show as much coastline and story as possible. I’ll seek my selected cubes of ice and drop them into a pleasing composition using the basic rules. As the wave goes out, I’ll quickly stab my tripod into the sand to steady my camera for a few moments, having selected a slow enough shutter speed as the waves go out. Keep in mind, this is a quite different experience with chunks ice bobbing around your legs. This might provoke a bit of fear for the uninitiated. But the trick is to remain steadfast and don’t worry about the sand ice or water unless a couch size chunk of ice is bearing down on you, which is hardly the case if you’re careful and observant. Many first-timers to Diamond Beach will get startled and turn and run when the first wave comes in with the fear of getting their feet wet. Most often this can cause tripping in the sand, or drop their camera into the waves, thus making their trip a little less than memorable photographically. The trick to getting the shot at Diamond Beach is preparation. You must be prepared! Proper clothing and footwear is a must! Make sure your outfitter or photography guide tells you what you need. Listen to him carefully when he suggests camera settings and don’t cut any corners. That way, you’ll get a memorable shot you’ll always treasure! We explore all of Iceland through the lens. Diamond Beach is just a small part. Join us in many of its unique and special places “HERE” If you would like to learn how to capture dynamic images in an ever-changing environment. You will come back with an incredible collection of images from this magnificent country.